Have you ever felt like your life has a soundtrack? (FYI, I told LC about my blog title before Friday was through. She copied me, not the other way round) The last few days have been rather tumultuous. Yet my day was AWESOME. I woke up singing "Be Still My Soul" and totally meaning it. On what could have been a day filled with anxious thoughts and worry, I was totally at peace. After breakfast in the sun at Eastern Market, I cruised over to Georgetown in the Falcone mobile with Tony and Lauren with Johnny Cash going full blast. Country music sounds way better when its being sung along to by a Texan and a Kentucky-an. 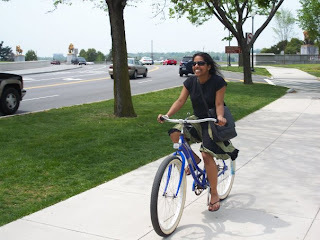 We hired bikes in Georgetown and had a mish cycle along the water, along the mall past the capitol to the Supreme Court, down via Lerae's place and back past the White House, across the Lincoln bridge, along the trail by the GW Parkway and back to Georgetown. It was one of the best days of my life. Resulting in Summer of '69 bursting from my lungs as we cruised past the White House. The weather was summery hot and humid, we chased pigeons, the occasional tourist and jumped fire hoses. And the seven of us rode through tree covered canopies with idiotic grins, singing the Sound of Music (and Apple Bottom Jeans - not sure what prompted that one!). Man was it epic! Cycling is my new favourite thing. I cannot remember the last time I was so happy. Absolute bliss. The afternoon was capped off with a trip to the Hershey's ice-cream store and Baked and Wired, before chilling at Lauren's and dinner at Busboys and Poets.